The award-winning, second-generation system features 14 sensors - one for every club in your bag. It automatically records and analyzes every shot you hit, combining Live Shot Tracking, GPS 2.0 and Tour Analytics to help any player make smarter decisions to shoot lower scores. A premium feature on the Arccos 360 app, Arccos Caddie is golf's first artificial intelligence and uses a player's data to help them make informed decisions. The user will be presented with a personalized strategy which would include shot distance - as impacted by wind and elevation - expected score, likelihood of hitting the fairway or green and their chances of missing it left or right. ULTRA LIGHTWEIGHT - Ultra lightweight sensors, sensors have zero swing impact! PERFECT GIFT - One of the hottest products in golf; for the golfer who wants a more analytical approach to their game, you can't beat this gift set! 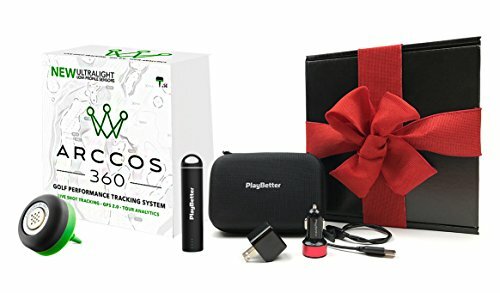 The PlayBetter Portable Smartphone Charger and USB Car/Wall Charging Adapters ensure your phone will stay fully charged so you'll be able to use your Arccos 360 all day on the course!